Design week is here, with enough trade-show events to make your head spin. 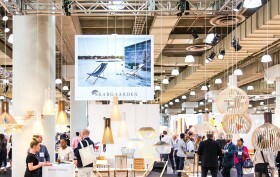 Not to miss is the massive ICFF and Dwell on Design, two places to hit for the absolute latest and greatest in contemporary design. Take advantage of the nice weather and enjoy a cocktail al fresco while viewing the new Ivan Argote sculpture at the Standard High Line, or head out to Sunset Park and meander through the massive Industry City’s open studios. The Judd Foundation creates a dialogue with James Rosenquist’s work, and Swizz Beats’ ex puts on her curatorial hat for an all-female show at Joseph Gross Gallery. Visit LA artist Marc Horowitz’s New York debut at Johannes Vogt, and discover your inner adventurist in a one-night pop up by NY Adventure Club, featuring their members’ death-defying photos of our beloved city.